The Namibian Government and development stakeholders came together to join forces in delivering on the country’s commitments to advance the Paris Agreement. A newly developed Partnership Plan connects international resources for climate mitigation and adaptation to five priority areas set by the government and builds a community around climate action in Namibia. strengthening coordination across national and international stakeholders to fast track decisions and interagency collaboration. “We [Namibia] are aware that the implementation of our NDC presents several challenges, particularly in terms of financial and technological resources. We know we cannot tackle these challenges alone and that we need coordinated and concerted efforts of all our partners. It is for this reason that Namibia has joined the NDC Partnership and we believe that it will be a valuable partnership to assist us in attracting transformative projects to achieve our NDC targets and contribute to the overall goals outlined in the Paris Agreement,” said the Honorable Bernadette Jagger, Deputy Minister of Namibia’s Ministry of Environment and Tourism. In its NDC, Namibia committed to ambitious mitigation and adaptation targets. In mitigation, Namibia committed to reduce greenhouse gas emissions by 89 percent by 2030 through climate smart agriculture, reducing deforestation and renewable energy. Namibia is also highly vulnerable to climate impacts: half of Namibia’s population relies on subsistence agriculture, and water insecurity is a serious threat to the welfare of the Namibian people and its economy. To reduce this vulnerability, Namibia seeks a diversity of solutions, including improving water security, preventing desertification and increasing resilience to flooding, to name a few. To achieve these goals, Namibia has embraced the NDC Partnership’s integrated planning process to strengthen coordination, resource mobilization and transparency on NDC implementation. Several members of the NDC Partnership have already pledged support to Namibia through the Partnership Plan, including the African Development Bank, the Food and Agriculture Organization of the United Nations, the French Development Agency (AfD), the European Commission, the Federal Republic of Germany (through GIZ and KfW), the United Nations Development Programme, the World Bank and World Resources Institute. Strong interest has also been expressed from several banks, including the Namibia Development Bank and NedBank, in investing in climate smart projects. A growing community of development partners, private sector and government institutions is quickly assembling behind an urgent call for action to address climate impacts to achieve global climate goals. “According to the recent publication on the State of the World’s Food Insecurity launched 11 September 2018, hunger is on the rise thanks in part to extreme climate events. Therefore, now more than ever we need to accelerate and scale up actions to strengthen the resilience and adaptive capacity of food systems and people’s livelihoods through national commitments like NDCs to cope with the impacts,” said Resident Representative Farayi Zimudzi of the Food and Agriculture Organization of the United Nations. 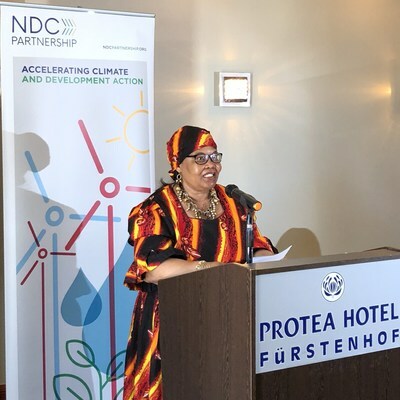 The NDC Partnership is a global coalition of countries and institutions committed to transformational climate action, co-chaired by the Federal Republic of Germany and the Kingdom of Morocco. The Partnership has grown to 83 member countries, 19 institutional members and seven associate members since its launch in November 2016. Namibia was one of the first countries in Africa to join the NDC Partnership and formalized its request for technical assistance in March 2018. The NDC Partnership is supporting more than 30 developing countries to enhance and implement their NDCs through technical assistance; capacity building; knowledge sharing and access to finance. Members give specific support to one another to strengthen policy frameworks; mainstream climate actions into national, sectoral and sub-national plans; develop budgeting and investment plans; share knowledge and resources and build more robust monitoring and reporting systems in line with country-driven requests.